Without our intervention, all the habitats on the Steyning Downland would revert first to scrub, then to deciduous woodland. Of course, woodland can be a good thing, but it would take a very, very long time to establish a truly wildlife-rich woodland. Instead we aim to conserve a variety of different habitats, all with their own diverse range of interesting species. We do this by working against the natural tendency of the land to revert to woodland, and we do this mostly by removing vegetation – cutting, chopping, burning . . . and even chewing! 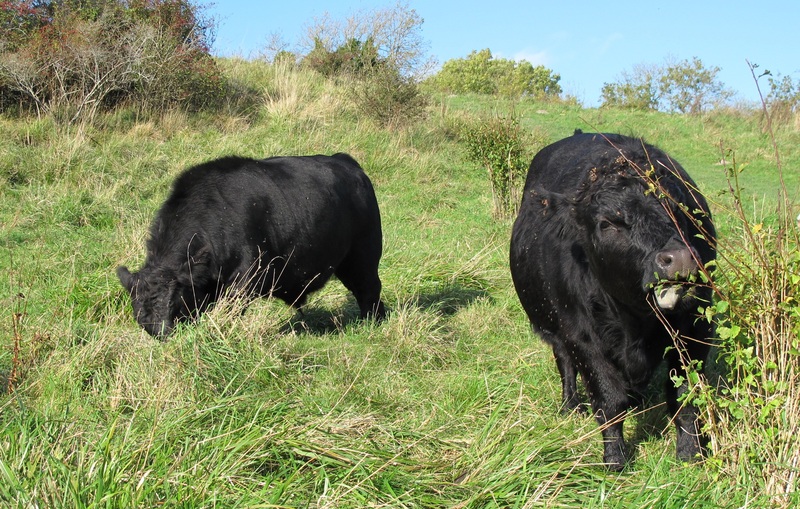 You can make a real difference to the conservation of our semi-natural habitats by joining our Conservation Volunteers, or our team of Lookerers, who look after our herd of Dexter cattle. Our Conservation Sub-Group have prepared a detailed Management Plan. You can download it here (links to files stored on Dropbox). In August 2017 the Steering Group approved a Woodland Management Plan for the Steyning Downland Scheme. This sets out an overarching strategy for improving the nature conservation value of our woodlands and you can view it here (links to files stored on Dropbox). We are very grateful to professional ecologist, Petra Billings for all her hard work and for donating her time an expertise to the SDS.